What is The Big Story? How do you talk to a child about death? When my daughters want to know why they no longer see a dear friend at church anymore, or how come their great-granddad had to die before they met him, I am profoundly grateful for the Resurrection. You will meet him one day, I say. You will see her again. This is not fluffy-winged, angel-studded wishful thinking, but a promise: Jesus has gone first, through death and into new life (1 Corinthians 15:20). He died and rose from the dead, and he has made a way for us to follow him. Clothed in resurrected bodies, we will sit at the table with him and feast; we will fill a city with song; we will see our heavenly Father face to face. We do not know what will happen between now and that moment, and sometimes the not knowing is bitter. But, I tell them, God knows how our stories go, and he will help us bear our burdens. He will shepherd us through those gates. I am glad for that hope when they sigh heavily or fearfully connect the dot “she died” with “I could die, too.” In those moments, we can look back to Jesus, who died—and yet what beauty came through his death! And we can look back further still to Lazarus, whose story is both a beacon of what Jesus can do, as well as a foretelling of what he would do in himself. 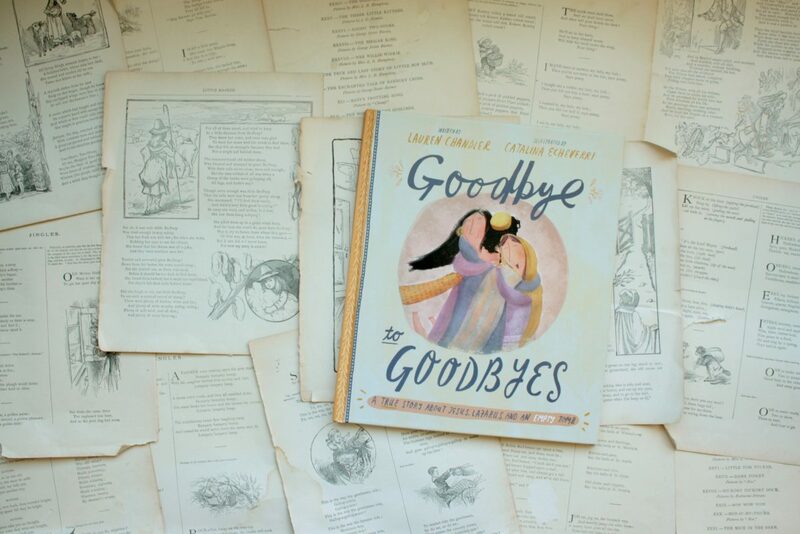 Goodbye to Goodbyes, the newest installment of my absolutely favorite series Tales That Tell the Truth, shares the story of Lazarus and his sisters. Lauren Chandler’s telling is both gentle and honest—Jesus doesn’t swoop on the scene like a superhero and command Lazarus to live amid a cloud of applause and confetti. He takes his time coming to Lazarus, and Chandler lets that sink in: Mary and Martha called for him, and Jesus didn’t come right away. And while he dawdled, Lazarus died. But when at last Jesus does come, we see why he waited. 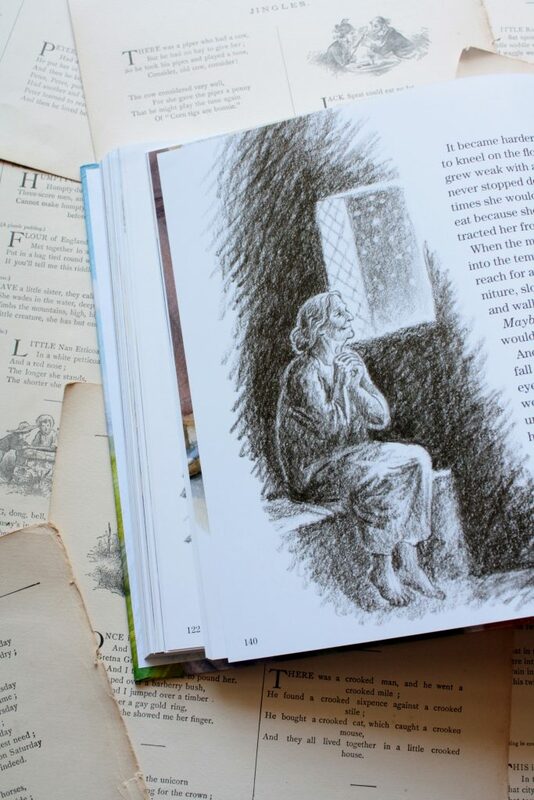 And in the meantime, we see him grieving with Mary and Martha—Catalina Echeverri’s illustrations (again, among my favorites) capture their grief in a way that feels true to life and yet isn’t overwhelming for young readers. 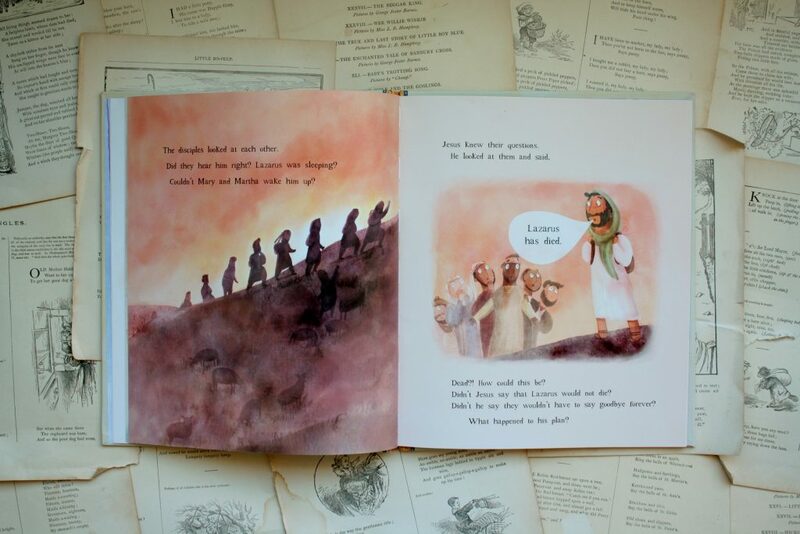 They weep and it’s messy, and the way Jesus holds them—I feel comforted just looking at it. I said in my post about The Friend Who Forgives that that one was my favorite of the Tales That Tell the Truth because it was the one I’d read most recently. Which means that this one must now be my favorite. And it is. But I think it might really and truly be my favorite because of the story and the grace with which it’s handled. 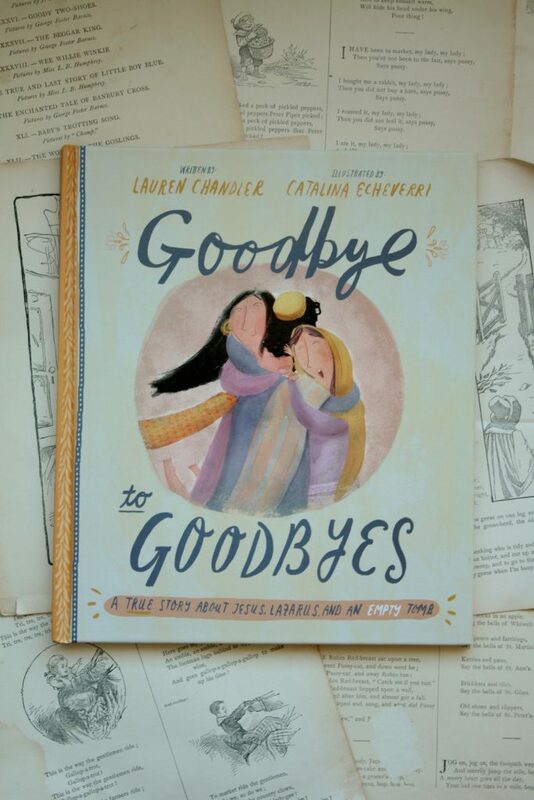 Giving children a book that addresses both the sorrow of grief and the hope of resurrection—that is beautiful and hard to do, and I am so grateful Lauren Chandler has done it. 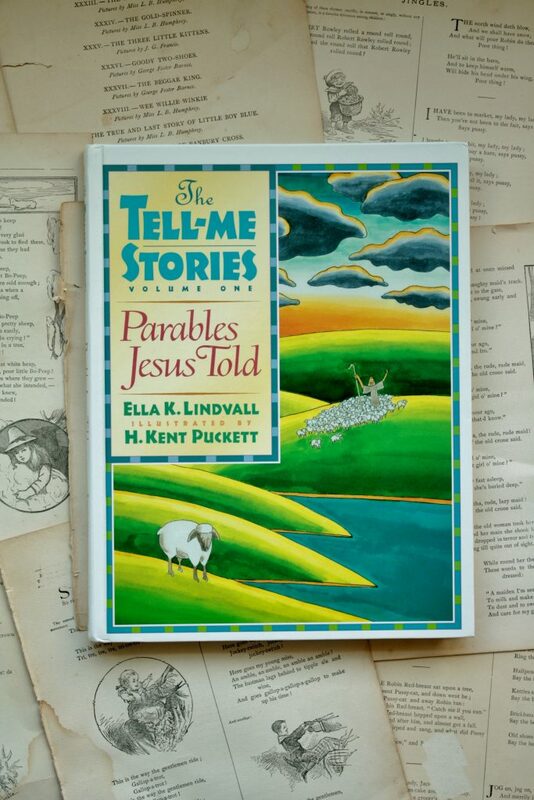 From the author of our beloved Read-Aloud Bible Stories comes this thrift store find: The Tell-Me Stories, a collection of Jesus’ parables told with warmth and welcome for the littlest, most fidgety crowd. 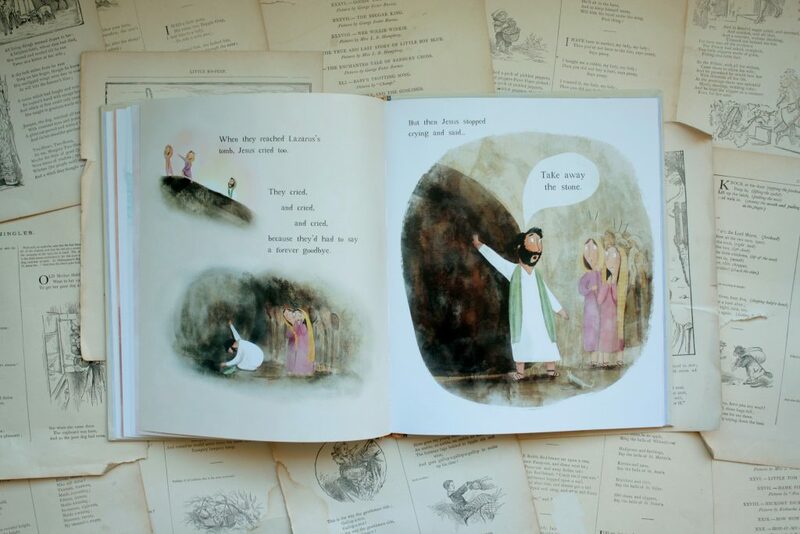 I love the way Ella Lindvall finds her way into a Bible story and goes straight for the heart of it. 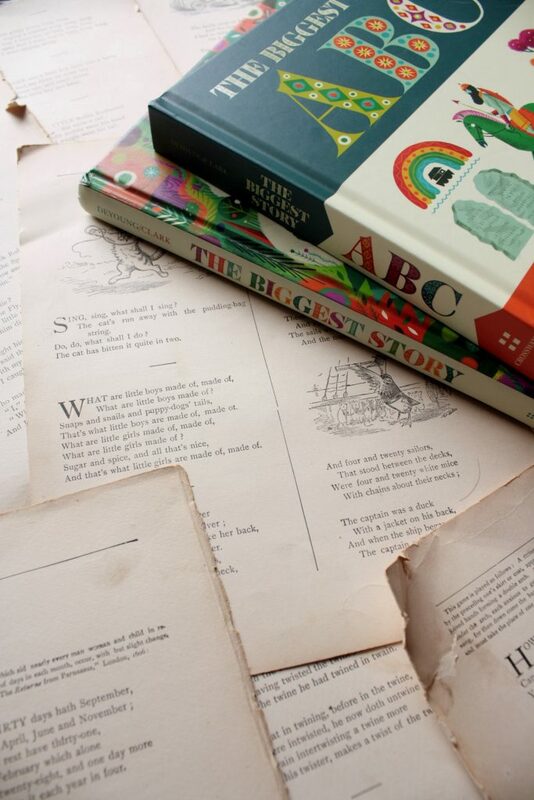 She peels back the layers (layers I hope my kids return to and delight in discovering as they grow older) and gets to the core of the story. That is what she shares with her audience of toddlers and parents who might think they’ve heard it all. 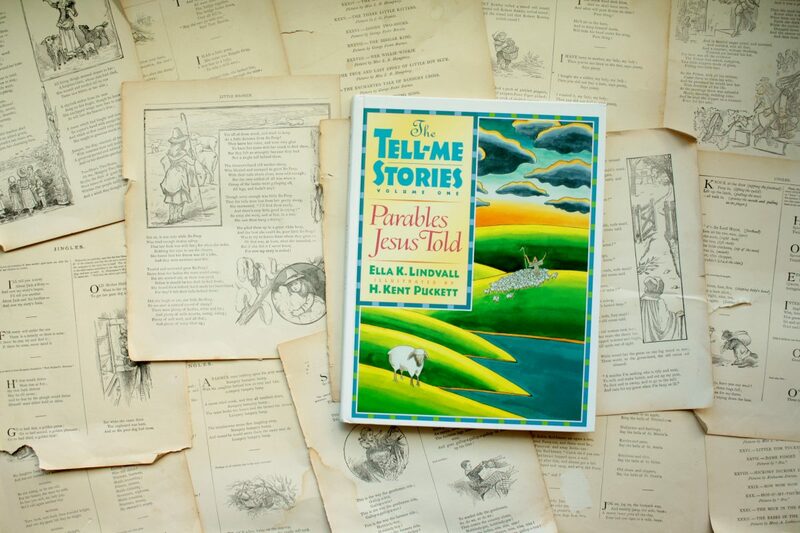 The Tell-Me Stories shares Jesus’ parables in a simple, straightforward way. Each one ends with a lesson, a tactic I don’t always love but that Lindvall does well. 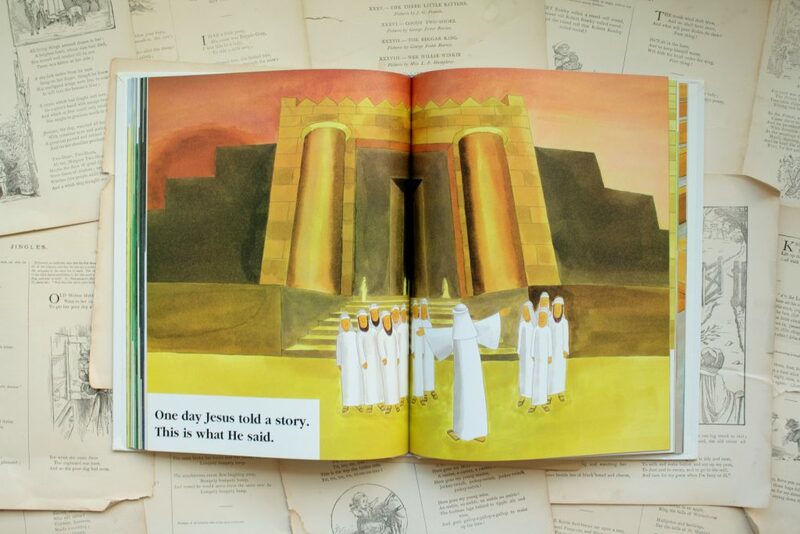 Through these stories we see Jesus the way he might have appeared to a child: welcoming, willing to part the grown-ups and make a path for the children to come to him. The weather isn’t cool, but it will be soon. And when it is, we plan to watch this series for the third (or possibly fourth?) time. This post originally appeared on this blog in October 2014, and we still love this show as much as we did then. 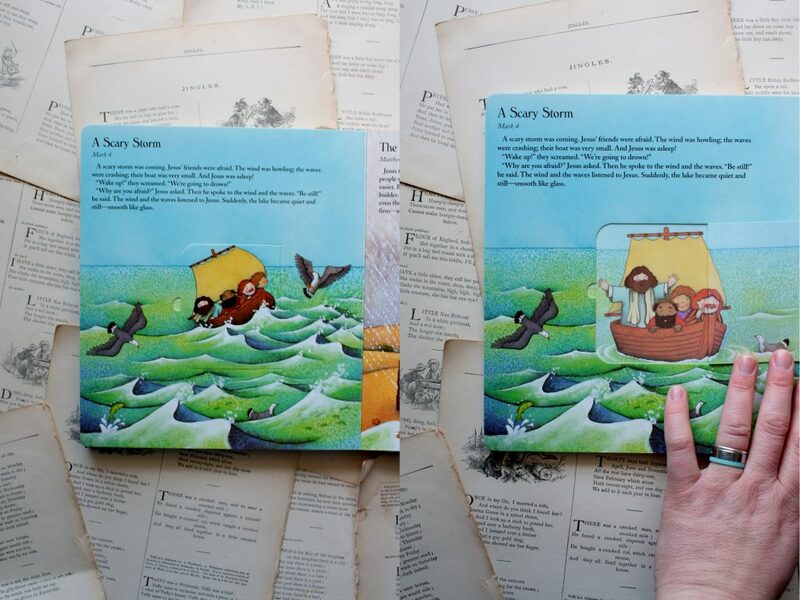 We have discovered some new favorites on JellyTelly since I first shared this post (The Nature of God, Stevie’s Trek to the Holy Land, Friends & Heroes—to name a few), but What’s in the Bible? remains one of our family’s All-Time Favorite Shows. I hope you love it, too! Way back in this blog’s beginning posts, I wrote a bit about What’s in the Bible? I told you that it was awesome and that you should watch it, but that was over a year ago and now it’s a cozy sort of season when movies and fleece blankets are in high demand, so I thought I’d give the series its very own post—even though it’s not a book, but a show about the book. Our daughters love these videos. 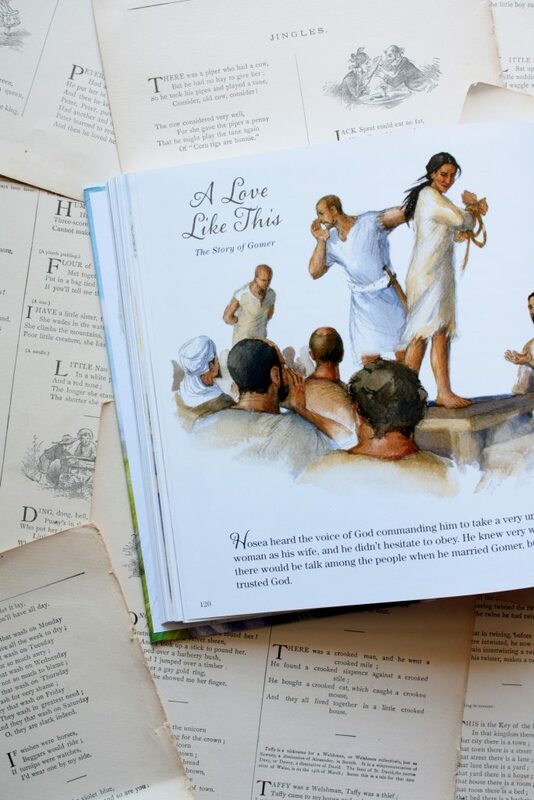 My husband and I love them, too, and through the show’s vivid illustrations we have both learned a lot about key aspects of the Bible. The episodes that touched on Paul’s back story or the silence between the Testaments switched lights on for both of us, and now our daughters tend to do things like, oh, list the books of the Bible in order just for fun. The show is full of catchy songs (a song about the Pentateuch—sung on a riverboat!) and great topical segments (A Pirate’s Guide to Church History!) 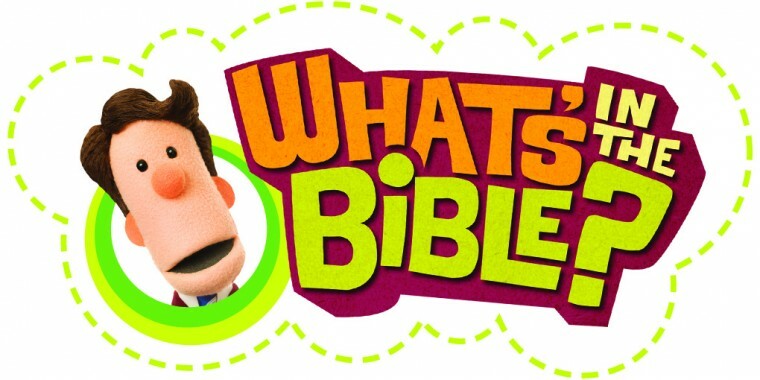 that go far beyond the traditional fare of Christian children’s programming. 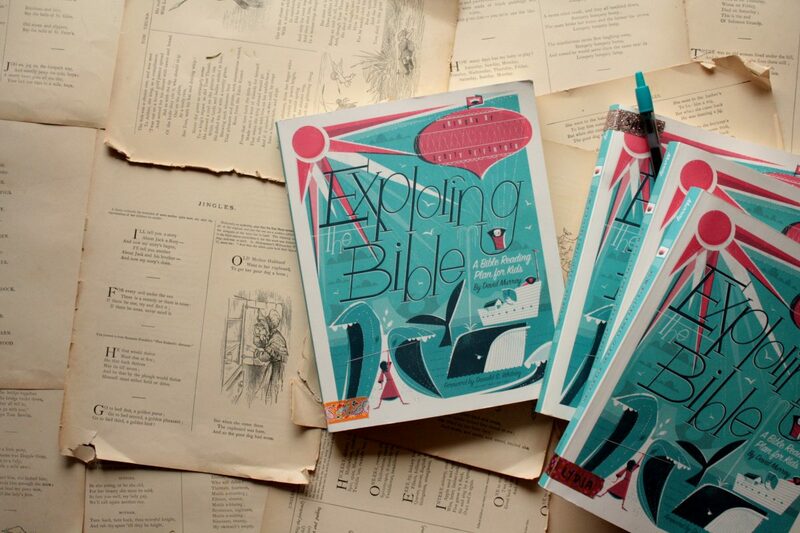 JellyTelly’s mission is “be a tool to help raise the next generation of Christians so they know what they believe and know how to live it and to help launch the next generation of Christian storytellers.” I love that vision and see it succeeding marvelously through What’s in the Bible? Within one week of starting this reading plan with the girls, I wanted to review it for you. “Look!” I wanted to cry. “We found it! The One!” Our relationship with family devotionals has been tumultuous, and after my recent revelation that we had only made it four days into our last attempt, I had the sort of clarity one has when, while trying to eat raw onions on a sandwich, one realizes that one is an adult who neither likes nor has to eat raw onions. Family devotionals aren’t working for us, I realized. And they don’t have to. We want to study God’s Word with our daughters; we want them to love it, to see the beauty and the brutality and the bottomlessness of it, and we want to them to love the One who wrote it. We need to find another way, I prayed. What does this look like for us? And then, behold! 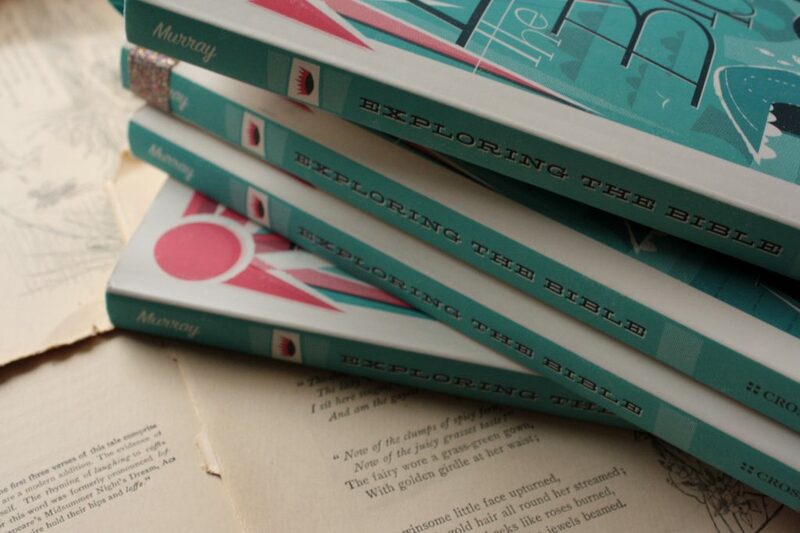 I ordered Exploring the Bible as a Christmas gift for Lydia, thinking it would be nice for her. But when I received it and flipped through its pages and began to see what it was about, I paused. I considered. I ordered two more copies. Lydia, Sarah, and I started working through it together and discussing it as part of our morning routine (while Phoebe colored Slugs & Bugs coloring pages and pondered the meaning of “atonement”). A week later, Mitch asked me to get him a copy, too, and now we’re all studying through the Bible together, and it is glorious. I was ready to review it right then but I refrained, thinking it would be better if we were farther in, had given it time to stick, and could be sure that Exploring the Bible was as awesome months later as it was at the start. Months later: it is still awesome. It is a reading plan for kids. 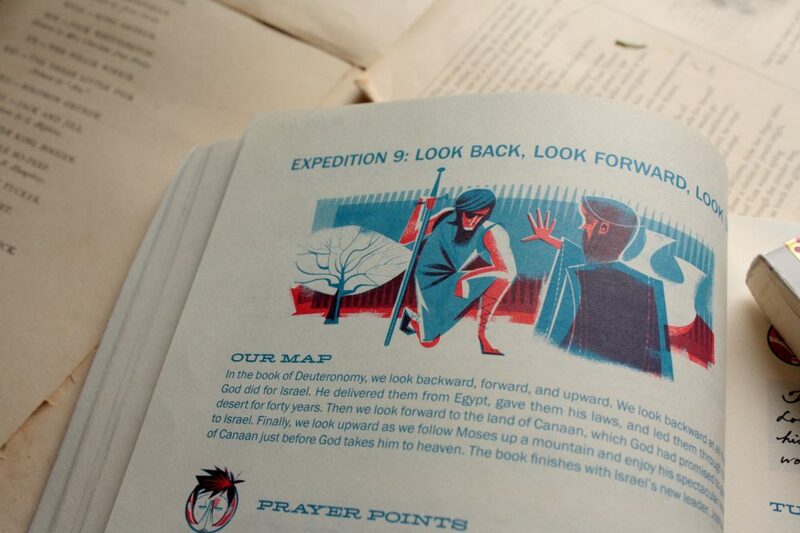 In one year, it takes readers through the entire story of the Bible by hopscotching from key passage to key passage. The point is not to read the entire Bible in a year, but to follow God’s Big Story through it in a series of short but central passages. David Murray arranged the readings in a series of week-long expeditions: one week we spend with Noah, reviewing the big picture of his story within the context of the rest of Scripture, then the next week we spend with Abraham. Murray helps us find a focus for the week but is otherwise pretty hands-off. No guided discussions here, no personal application. I’m glad for that. Each day, our reading is about five verses long. Lydia, Mitch, and I do ours independently in the morning; Sarah does hers during our discussion. Later in the morning, the girls and I read the passage, then I ask one of the girls to narrate it back to me. Together we answer the one simple question in the workbook, and then we either stop there or we let discussion blossom however it likes. I love the questions in this book, because they point us back to the text: Murray doesn’t ask us to extrapolate on the text or draw out morals, but asks us instead to look back at a key verse and see what really happened. They direct us back to the text itself, not to our own thoughts on it, and I love that. Our own thoughts bubble up naturally as we discuss the passage, but I am glad the questions anchor our discussion in what Scripture really said, not just in how we respond to it. Also: Scotty Reifsnyder’s illustrations have this great retro feel that has spurred interesting discussion as well. 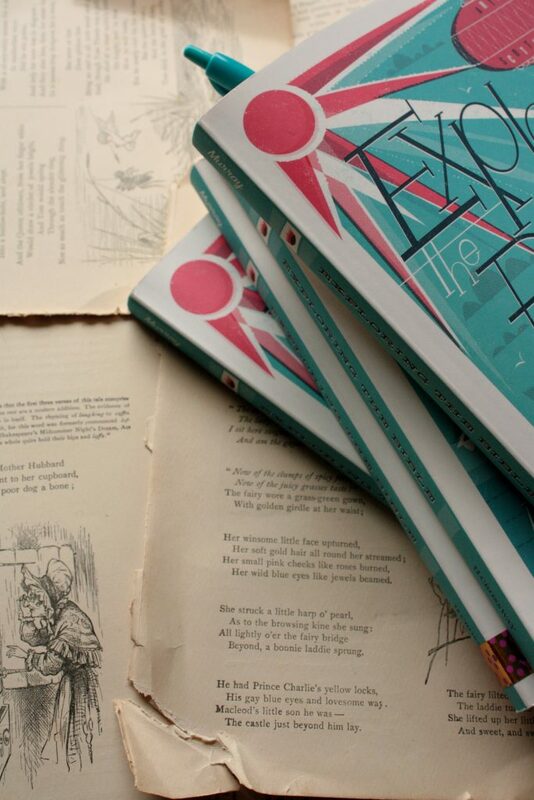 And the book itself—both its design and its actual composition—is a pleasure to use. It feels so nice to hold it and turn the pages. Taking a year to trace the big story of Scripture through Old Testament and New has already begun to bear fruit in us as well as in the girls. 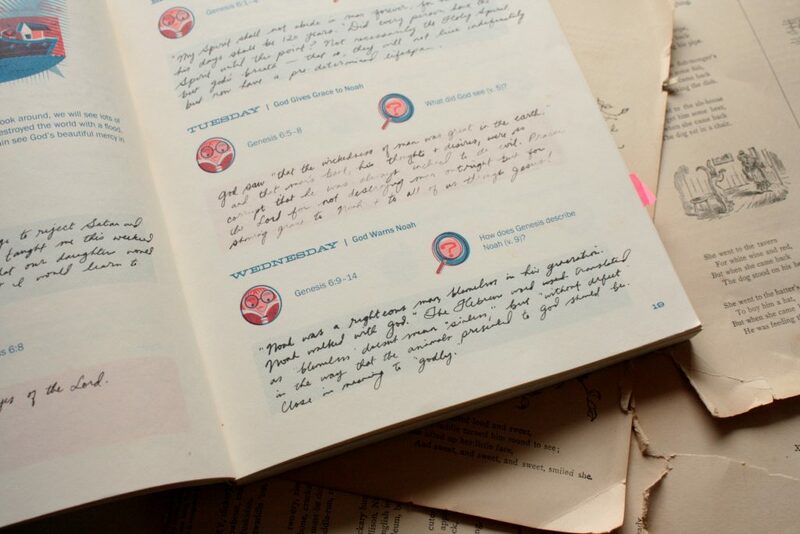 We can pick out the main themes of each book more clearly; we have already spotted connections from one story to the next that we might have missed if we’d spent weeks on each story rather than days. 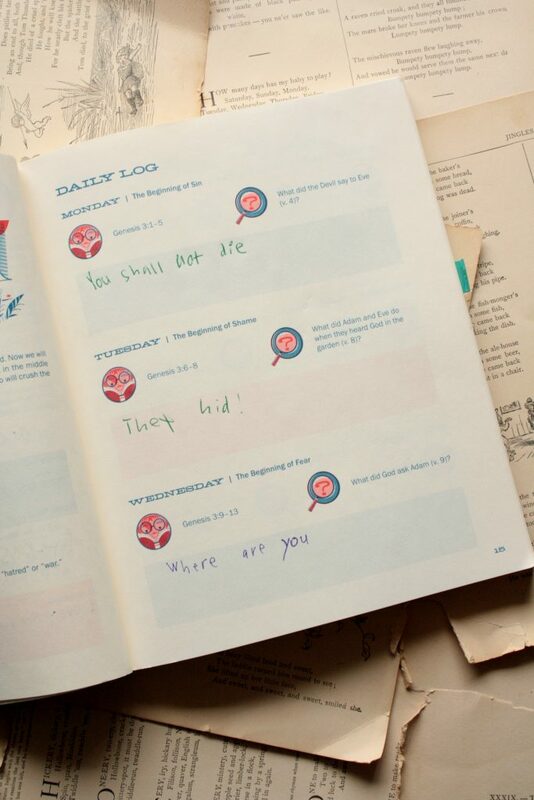 Do our kids still fidget and complain when it’s time to read Scripture? Yes. But Exploring the Bible is like a set of training wheels for the spiritual disciplines of prayer and Scripture reading, and watching our girls gain their balance and become more confident as they read the Bible has been delightful. 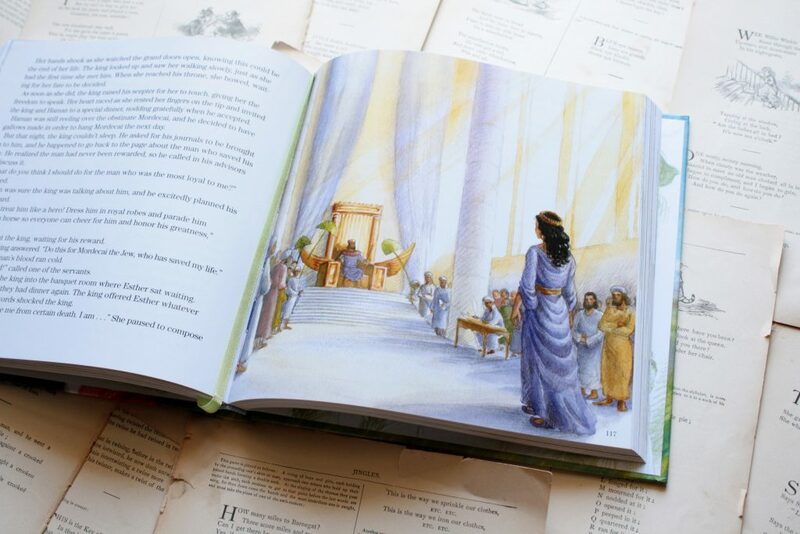 I am already a little sad that Exploring the Bible won’t go on forever, but I am also excited to see what we learn from this experience and how that shapes our future family reading. 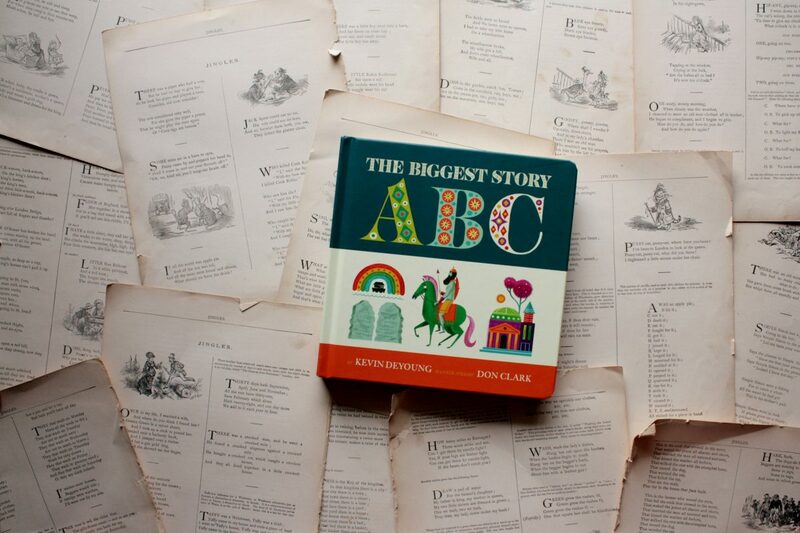 What I loved best about Kevin DeYoung’s book The Biggest Story was the way he distilled the grand narrative of Scripture down into a straightforward, engaging book for children. I was impressed. Funneling a vast story like that into the uncluttered language of childhood (without dumbing it down) is a challenge, and DeYoung succeeded admirably. 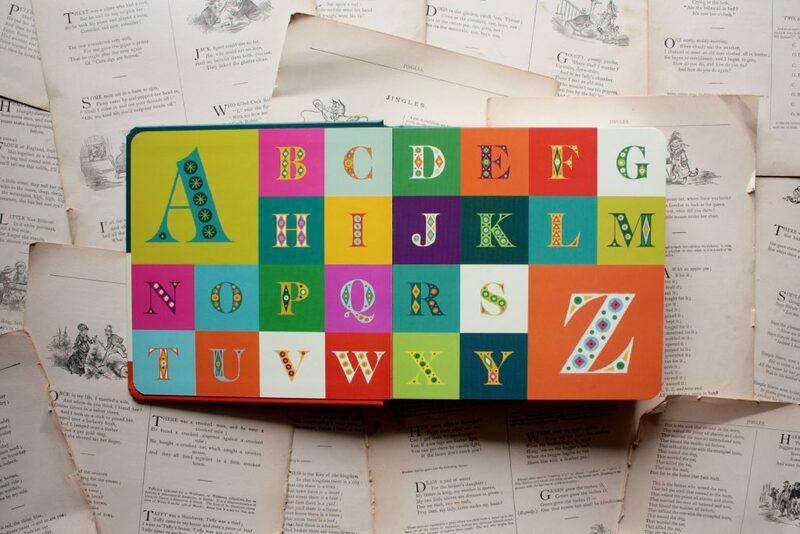 With his new book, The Biggest Story ABC, DeYoung distills the gospel down even further and writes a remarkably coherent explanation of it for toddlers, using the letters of the alphabet as guideposts for the story. And the way DeYoung describes concepts like substitution and atonement is truly beautiful. Don Clark illustrates these concepts richly, opening visual doors in them so we can behold their beauty in a new way. I set The Biggest Story ABC aside as a Christmas gift for Phoebe, and that seems a painfully long time to wait to share it with her. I can’t wait to read it through together and hear what conversation stems from this story—our story. The one we are never to young—and never too old—to hear. Flaps are big at our house. We love lifting them, sliding them, peeking under them when we think no one is looking. (One of us also enjoys tearing them—alas!) We have a rather impressive stash of books with flaps (or books formerly with flaps), and we add to it whenever we can. 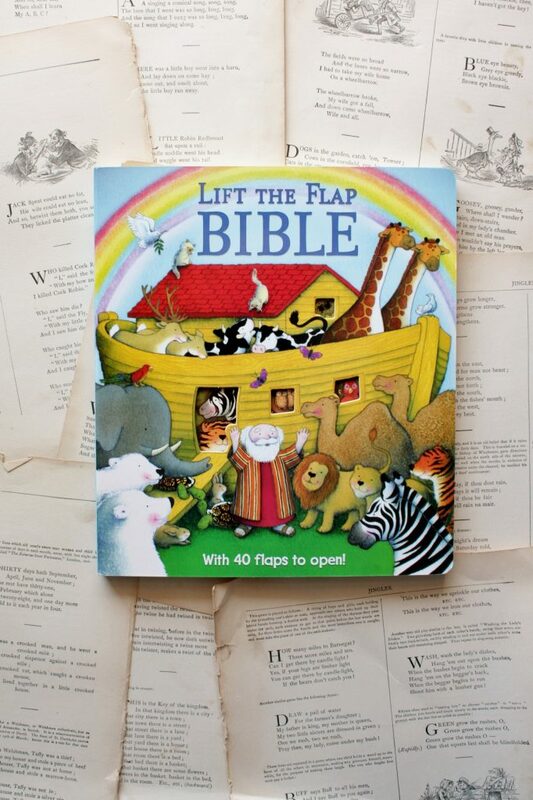 But Sally Lloyd-Jones’ Lift-the-Flap Bible is one of my favorite recent additions to the collection, and not just because it has flaps and we love them. 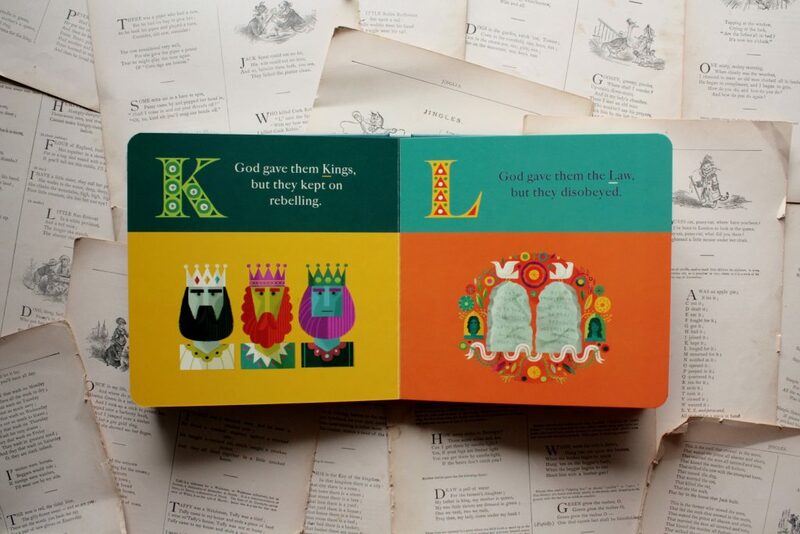 Every time we read one of Lloyd-Jones’ books for toddlers, I am in awe of her ability to articulate the love and justice of our God in a few artful sentences. 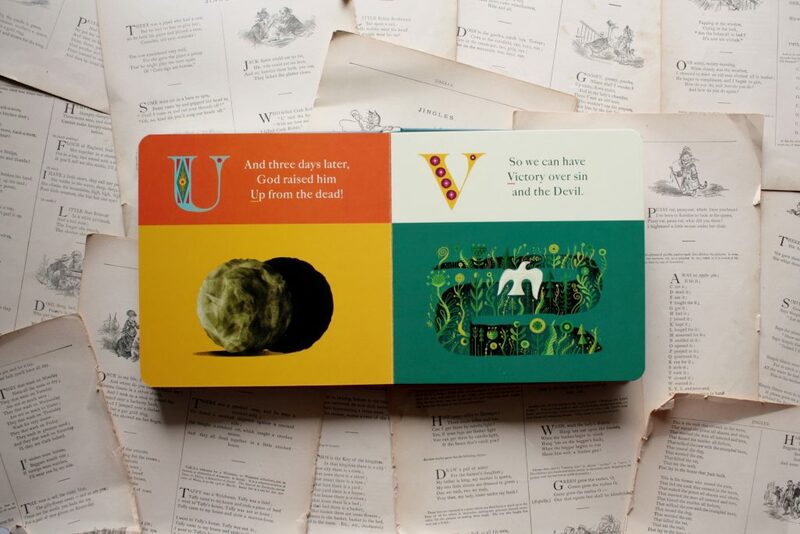 It is a feat that seems simple because the end product looks small, but every word in this sturdy Bible is hand-picked—not one is superfluous. 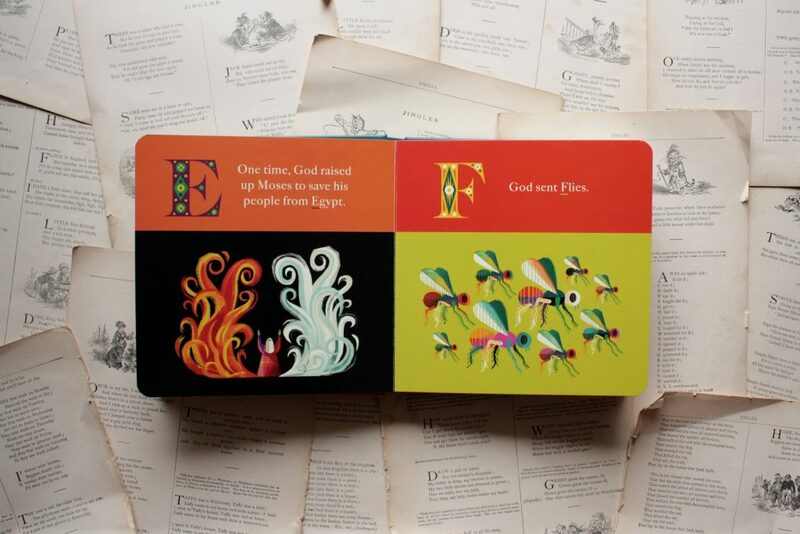 Tracey Moroney, too, illustrates these short stories with vibrant colors, and those flaps make her paintings interactive: the volcano erupts; the whale breaches; the waters part. 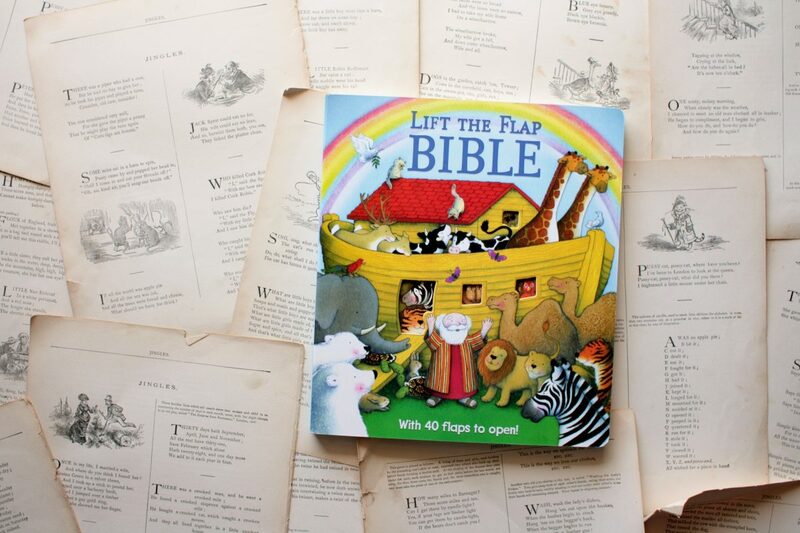 This book is perfect for exploring with all five senses (because you know the little ones will try and taste it, too, and new books smell so good) and for sowing that first planting of the gospel in the hearts of the smallest readers. 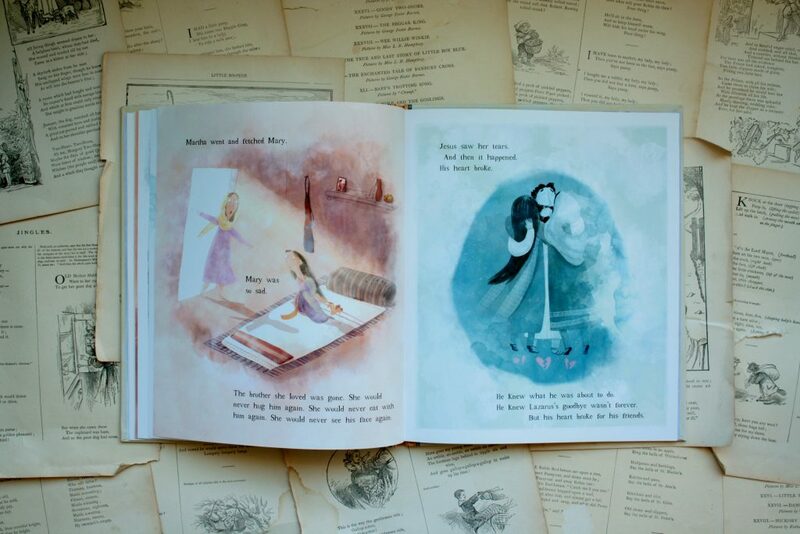 After reading a picture book that praised Eve for her courage in defying God, I almost quit my search. 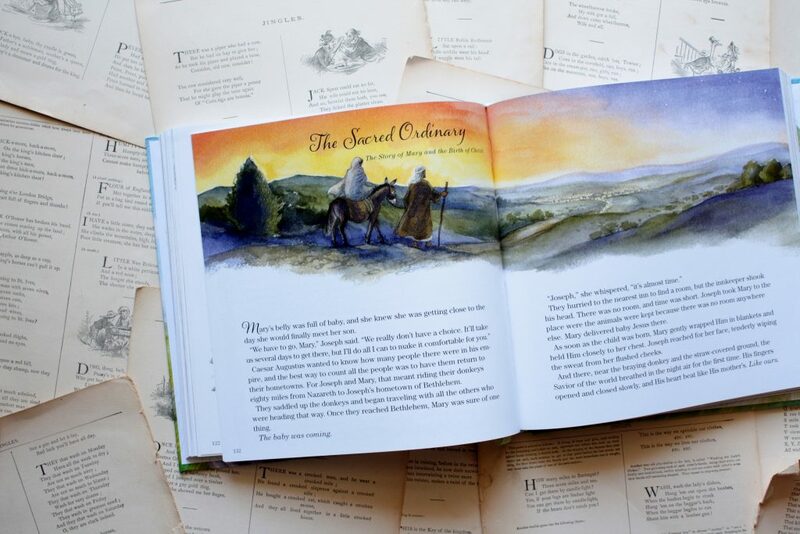 But the stories of so many women are sown quietly throughout Scripture, and I loved the idea of drawing those stories out. I loved the idea of reminding our daughters, in a time when Paul is derided as a misogynist and the question of women’s roles in church is hotly debated, that they have a treasured place in God’s Great Story. Moses went on to guide the Israelites out of Egypt, but his mother, sister, and midwife shielded the infant Moses from Pharaoh’s wrath. Israel fell into fragments, yet one Moabite woman became the thread God used to sew redemption into Israel’s tapestry. Surely some author has told the stories of those women in an honest, yet beautiful way? Right? One that steers clear of the “bad girls of the Bible” motif? Yes. Dear friends, the answer is yes. Angie Smith did it, and she did it well. Breezy Brookshire’s illustrations get the tension of that question just right: her fluid, glowing watercolors are punctuated by understated pencil drawings. By mixing those two, she captures the tension of our sin and God’s grace in a luminous way. For Such a Time as This is, I suppose, a selective story Bible. It’s obviously not comprehensive, but focuses on the women of Scripture specifically. 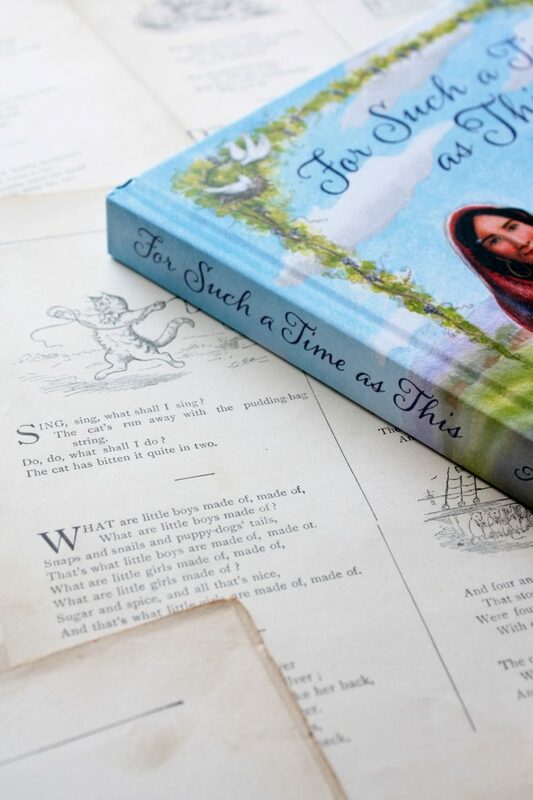 But it is also a devotional, as each story ends with a section for young girls to read alone or with parents, and for a prayer that families can pray together for their daughters. If your daughter has a birthday this summer and you invite us to her party, be warned: we’ll probably buy her this book. We are currently reading this aloud as a family and I love it more after each reading. 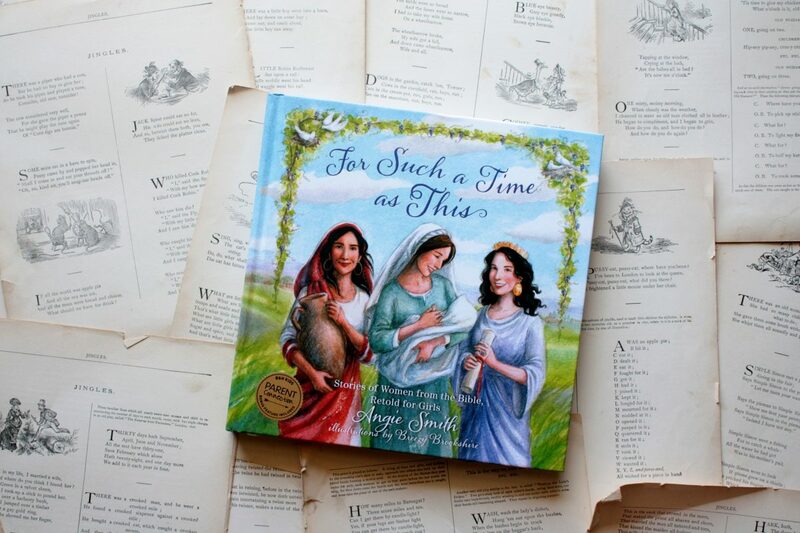 We’ve read about Abigail and Bathsheba, Hagar and the Queen of Sheba, and Angie Smith does a beautiful job of connecting each story to the Big Story of Scripture, while drawing in details that bring their stories to life. My daughters are enthralled with all these women they had never met before, and I am a little obsessed with the illustrations. I just wanted you to know that. I loved this book when I wrote about it, but we love it now, all of us. The girls each take sections from the devotional readings, I read the prayer, and even Phoebe repeats our “Word of the Day” and memory verse after me. This book is one of our favorites now. This blog has ’em. Any link that takes you to an Amazon page will send a small percentage of your purchase back to this blog. Thank you for supporting Little Book, Big Story! I do sometimes accept review copies of books, but I am not compensated in any way for my reviews. You can learn more about my review policy here. © 2019 Little Book, Big Story. All rights reserved.